Prosciutto and Melon go together so well. These Prosciutto with Melon Appetizer Cups are a take on the classic appetizer. Prosciutto is crisped up, mixed with melon, cilantro and citrus, then piled into crunchy phyllo cups. 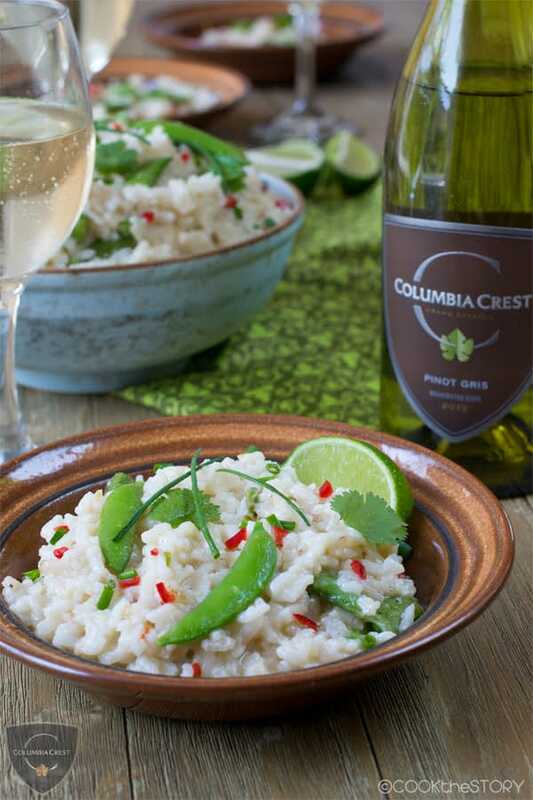 Crispy, sweet, salty and fresh and then made even better with a cold glass of Columbia Crest Pinot Gris. This post is part of a year-long series of wine paired recipes that I have been hired by Columbia Crest to develop. 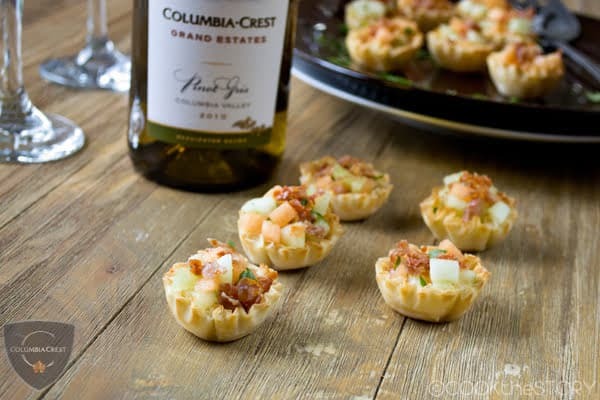 To see all my Columbia Crest wine-paired recipes, click here. Pin it to your Finger Foods Board! Recently I received an email from a reader asking for dinner party advice. They’ve had fewer dinner parties since they had kids. And when they do have company, it’s pretty stressful trying to cook, talk and make sure that the kids don’t tear the house apart. Dinner parties are completely different for me now than how they used to be. I used to spend the whole day in the kitchen happily cooking for guests. Now I’m lucky if I can spare 30 minutes. The key to me, therefore, is to keep it as quick and simple as possible. This Prosciutto with Melon Appetizer is perfect as a quick, easy and simple appetizer. It’s a play on the classic prosciutto and melon combination. But there’s no fiddly wrapping of melon in meat. Instead, you chop up the melon and mix it with cilantro and citrus juices. Then you crisp up the prosciutto in a frying pan and chop it up too. The melon mixture goes into pre-baked phyllo cups (look for these in the freezer section near the frozen pie crusts, puff pastry and regular phyllo) and then you top the melon with a sprinkle of the crispy prosciutto. 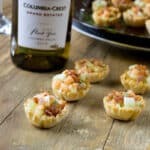 Serve these little phyllo cups with a cold bottle of the delicious refreshing Columbia Crest 2012 Grand Estates Pinot Gris Washington State wine. The citrus notes in the wine match the citrus in the melon mixture and the melon brings out the fruity flavors in the wine. The salt in the prosciutto cuts the sweetness and adds fun interest to the pairing. If you’re short on time on the evening of the dinner party, you can absolutely make the melon mixture the day before. Cover and refrigerate. You can crisp the prosciutto up to 2 hours ahead of time. Keep it uncovered on the counter so that it doesn’t get damp and soggy. The shells come pre-baked but if you want to give them some extra crispness (I usually do), bake them for 3-5 minutes at 350F. That can be done when you’re cooking the prosciutto. Keep them uncovered on the counter too. This little appetizer is ready from start to finish in 15 minutes. Now, all you need is a 15 minute entree and you’re good to go. Especially if you asked your guests to bring dessert (I always do!). For another great dish that pairs well with the Pinot Gris, be sure to also check out my recipe for Asian Oven Baked Risotto. For such a quick and easy appetizer these melon cups play with a lot of flavors. The melon is sweet and light. Lemon and lime add tang. Cilantro brings some herbiness. The crispy prosciutto on top smoothes it all together with a salty meaty taste. And everything is contained in a crunchy mouthful of phyllo. 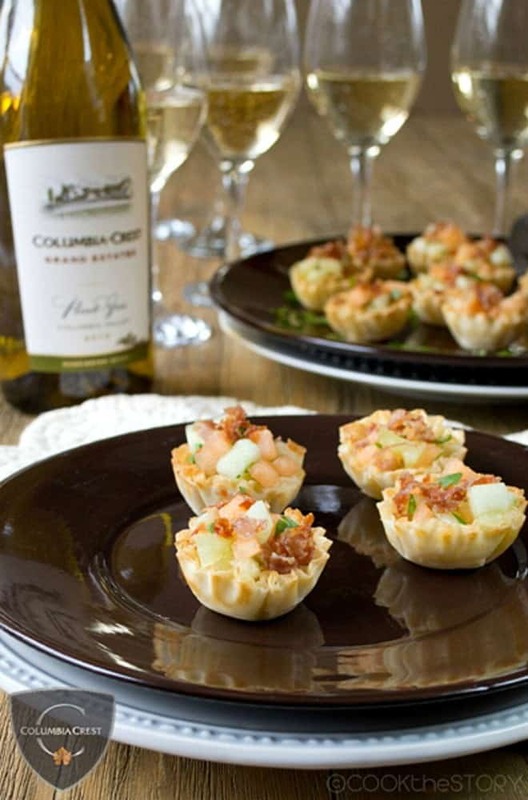 These little bites bring out the melon and citrus aromas in the [url:1]Columbia Crest 2012 Grand Estates Pinot Gris Washington State[/url] wine. The vibrant flavors of the melon cups are a perfect match for this vibrant Pinot Gris. In a medium bowl combine the cantaloupe, honeydew, cilantro, lemon and lime juice. Warm the olive oil in a medium skillet over medium-low heat. Add the prosciutto in a single layer. Cook, flipping occasionally until it has darkened and crisped in places. Transfer to a plate lined with kitchen towel to drain. Chop finely. Arrange the phyllo cups on a serving plate. Spoon the melon mixture into the cups. Top with the chopped prosciutto. You are too brilliant! I would like about a dozen of these and a cold glass (or three) of that lovely wine. And a delightful friend to sit and chat with while eating and sipping! It would be perfect. Prosciutto and melon is one of my favorite spring/summer appetizers, and your crispy-citrusy twist on it sounds terrific, Christine! Thanks Georgia! It’s a favorite of mine as well. I would do anything for these right now!